Chop parsley and small chive. Pour mozzarella balls in a bowl. Add olive oil, parsley, small chive, salt and pepper. Cover and leave aside for at least 30 mn. (If you can leave it overnight, even better). Cut tomatoes and basil leaves in half. 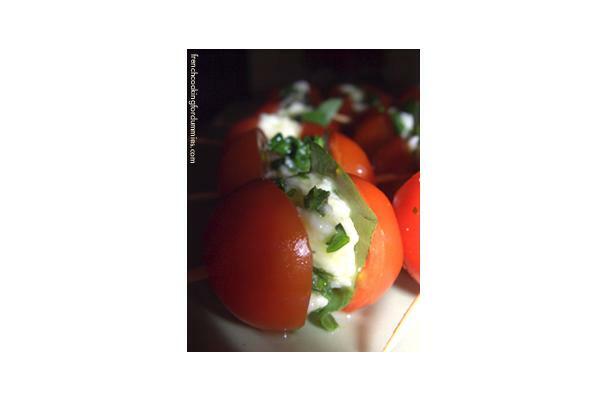 On a toothpick, line up one half of tomato, a piece of basil leaf, a mozzarella ball and finish with the second tomato half. If basil is too strong of a flavor for kids, simply omit the basil and stack the tomato and cheese together on picks.